Logging through casing began with the gamma ray log in the later part of the 1930’s and this tradition has continued to the present. 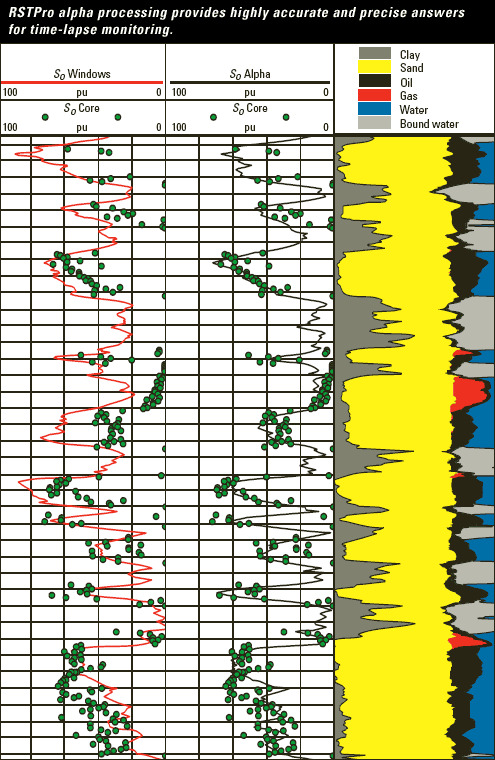 The gamma ray log is used for depth correlation on many logging and wireline services. Most cased hole logs have a GR and casing collar log (CCL) for depth control. Slim hole tools for use through tubing or hostile environments, as well as full size tools for casing or open hole applications, are usually available. In the mid 1940’s, the neutron log was added and recorded through casing. Correlation, shale volume, porosity, and gas zones could be observed with these two logs. Both were uncalibrated logs, so the analyst had a fair amount of work to do. Analysis of ancient logs is covered elsewhere in this Handbook. Modern gamma ray and neutron logs are properly calibrated and scaled, but a number of environmental corrections may be required. The pulsed neutron (thermal decay time) and induced gamma ray spectral logs followed in the 1960’s, as did the natural gamma ray spectral log. With these, we could assess water saturation and lithology through casing, at least in favourable circumstances. 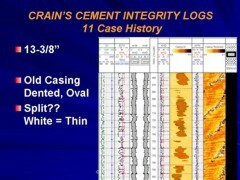 Compensated neutron logs with some corrections for casing and average cement conditions appeared in the 1970’s. This log was scaled in porosity units so it could be used more directly for reservoir evaluation than previous neutron logs. Compressional and shear travel time (slowness) logs appeared in the 1980’s and were suitable for both open and cased hole. The modern logs that cannot be run in casing are the dipmeter, resistivity image, nuclear magnetic resonance, and SP. Cement bond, cement mapping, and casing inspection logs are covered elsewhere in this Handbook. Production logging, perforating, testing, and completion or workover services run on wireline in casing are not covered in this Handbook. Petrophysical analysis using these cased hole measurements proceed along the same lines as with the equivalent open hole logs, with only minor exceptions. The first is that the annulus between the casing and formation must be well cemented, with good cement fill up. Most cased hle logs suffer from poor cement. A good cement bond or cement mapping log should be run and remedial action taken before running cased hole logs for reservoir evaluation. The analyst needs to determine whether further borehole fluid, casing size and weight, cement sheath, or other environmental corrections are required. Some corrections are made at the time of logging, others are not, and this varies with the age of the tool. A brief outline of each of the tools useful in cased hole reservoir evaluation are given below, condensed from Schlumberger Services Catalog, 2004 Refer to appropriate Chapters in this Handbook for additional details on tool theory or petrophysical analysis methods. 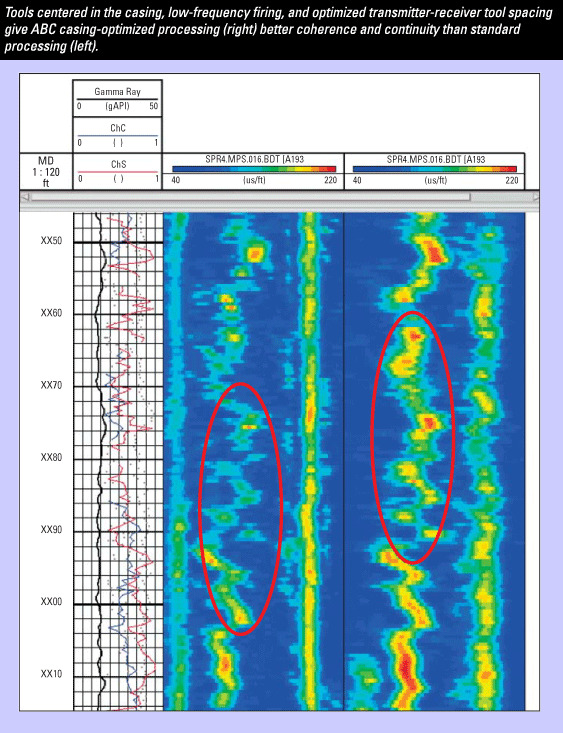 Gamma ray tools record naturally occurring gamma rays in the formations adjacent to the wellbore. This nuclear measurement indicates the radioactive content of the formations. Effective in any environment, gamma ray tools are the standard device used for correlation of logs in cased and open holes. Spectral gamma ray tools provide insight into the mineral composition of formations. The total gamma ray spectra measured is resolved into the three most common components of naturally occurring radiation in sands and shales—potassium, thorium, and uranium (K, Th, and U, respectively). 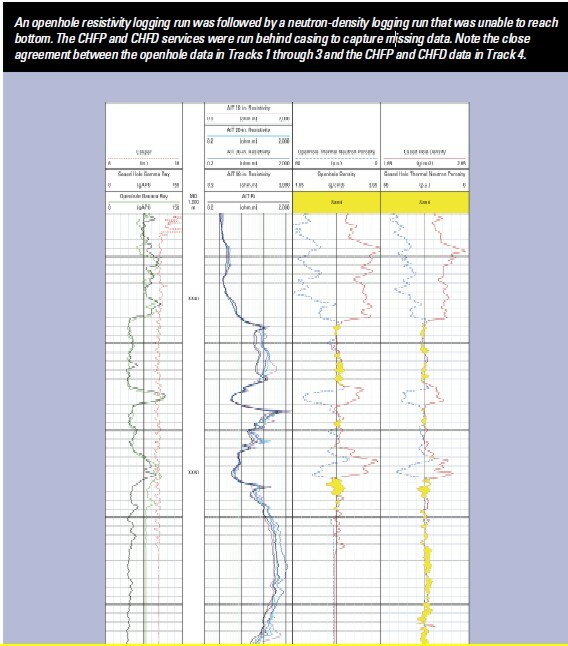 These data are used to distinguish important features of the clay or sand around the wellbore. The clay type can be determined, and sand can be identified as radioactive. The deposition of radioactive salts behind the casing by the movement of water can also be identified. The natural gamma ray spectrometry tool uses five-window spectroscopy to resolve the total gamma ray spectra into K, Th, and U curves. The standard gamma ray (SGR) and the gamma ray minus the uranium (CGR) component are also presented. The computed gamma ray or Th curve can be used to evaluate the clay content where radioactive minerals are present. Cased hole formation porosity services make accurate formation porosity and sigma measurements in cased wells. The measurement, based on an electronic neutron source instead of a chemical source, uses borehole shielding and focusing to obtain porosity measurements that are affected only minimally by borehole environment, casing, standoff, and formation characteristics such as lithology and salinity. The large yield of the neutron source enables the use of epithermal neutron detection and borehole shielding. As a result, the porosity measurements are affected only minimally by the borehole environment and formation characteristics, such as lithology and salinity. Five detectors provide information for porosity evaluation, gas detection, shale evaluation, improvement of the vertical resolution, and borehole correction. The measurements can be performed in both cased and open holes. Compensated neutron logs have traditionally been run as a porosity indicator in cased wells. Although it provides a good estimation of formation porosity in most conditions, the unfocused nature of the CNL log does not allow correction for environmental effects, such as thickness of casing and cement, or effects resulting from the position of the tool and casing in the borehole. For the highest possible accuracy, CHFP service is the measurement of choice. Compensated neutron tools measure the hydrogen index of downhole formations. The measurements are converted to porosity values, which in combination with density tool measurements provide an indication of lithology and gas in zones of interest. Some compensated neutron tools provide thermal and epithermal measurements. Thermal measurements require a liquid filled borehole. Epithermal measurements can be made in air or gas filled boreholes. The compensated neutron log tool contains a radioactive source that bombards the formation with fast neutrons. The neutrons are slowed, primarily by hydrogen atoms in the formation. Detectors count the slowed neutrons deflected back to the tool. Because the tool responds primarily to the hydrogen content of the formation, the measurements are scaled in porosity units. Both epithermal (intermediate energy) neutrons and thermal (slow) neutrons can be measured depending on the detector design. These tools use two thermal detectors to produce a borehole-compensated thermal neutron measurement. The dual-energy neutron log has two thermal and two epithermal detectors that make separate energy measurements for gas detection and improved reservoir description. Reservoir saturation tools such as the pulsed neutron (TDT) are still widely used. The newesu, the reservoir saturation log (RST) makes both formation sigma and C/O ratio measurements that allow the calculation of water saturation without the need for a resistivity log.. In formations with high-salinity formation water, the sigma measurement has been used for several decades to determine water saturation. The C/O ratio measurement can accurately evaluate water saturation in moderate to high porosity formations regardless of water salinity. This calculation is particularly helpful if the water salinity is low or unknown. If the salinity of the formation water is high, the Dual-Burst Thermal Decay Time measurement is used. A combination of both measurements can be used to detect and quantify the presence of injection water of a different salinity from that of the connate water. Time-lapse measurements of water saturation can be used to monitor the performance of a well or reservoir over time. 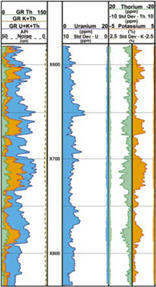 TDT logs have gone throufg many evolutionary changes over the years so reservoir monitoring is difficult, especial;;y in low porosity reservoirs. Some age related normalization and bore hole corrections are often needed to makes sense of the data. Dipole shear sonic coupled with automated sonic waveform processing for slowness determinations, provides accurate formation compressional and shear slowness measurements in cased wells. Slowness processing is based on optimally designed frequency filters and advanced signal processing. This method significantly attenuates casing arrivals to facilitate the clean extraction of formation slowness. The dipole shear sonic log combines monopole and dipole sonic acquisition capabilities. The transmitter section contains a piezoelectric monopole transmitter and two electrodynamic dipole transmitters perpendicular to each other. An electric pulse at sonic frequencies is applied to the monopole transmitter to excite compressional- and shear-wave propagation in the formation. For Stoneley wave acquisition, a specific low-frequency pulse is used. The dipole transmitters are also driven at low frequency to excite the flexural wave around the borehole. The tool is made up of three sections: acquisition cartridge, receiver section, and transmitter section. An isolation joint is placed between the transmitter and receiver sections to prevent direct flexural wave transmission through the tool body. The receiver section has an array of eight receiver stations spaced 6 inches. [15 cm] apart and 9 ft (2.74 m) from the monopole transmitter, 11 ft (3.35 m) from the upper dipole transmitter, and 11.5 ft (3.50 m) from the lower dipole transmitter. Each receiver station consists of two pairs of wideband-piezoelectric hydrophones aligned with the dipole transmitters. Summing the signals recorded by one pair of hydrophones provides the monopole waveform, whereas differentiating them cancels the monopole signal and provides the dipole waveform. When a dipole transmitter is fired, the hydrophone pair diagonally in line with the transmitter is used. Four sets of eight waveforms can be acquired from the four basic operating modes fired in sequence. A special dipole mode enables recording both the inline and crossline (perpendicular) waveforms for each dipole mode. This mode, called both cross receivers (BCR), is used for anisotropy evaluation. Elemental capture spectroscopy lods use a standard americium beryllium (AmBe) neutron source and a large bismuth germanate (BGO) detector to measure relative elemental yields based on neutron-induced capture gamma ray spectroscopy. The primary elements measured in both open and cased holes are for the formation elements silicon (Si), iron (Fe), calcium (Ca), sulfur (S), titanium (Ti), gadolinium (Gd), chlorine (Cl), barium (Ba), and hydrogen (H). Wellsite processing uses the 254 channel gamma ray energy spectrum to produce dry-weight elements, lithology, and matrix properties. The first step involves spectral deconvolution of the composite gamma ray energy spectrum by using a set of elemental standards to produce relative elemental yields. The relative yields are then converted to dry-weight elemental concentration logs for the elements Si, Fe, Ca, S, Ti, and Gd using an oxides closure method. Cased hole formation resistivity logs make direct, deep reading resistivity measurements through casing and cement. The concept of measuring resistivity through casing is not new, but recent breakthroughs in downhole electronics and electrode design have made these challenging measurements possible. Now the same basic measurements can be compared for open- and cased holes. Cased hole formation density logs make accurate formation density measurements in cased wells. A chemical gamma ray source and three-detector measurement system are used to make measurements in a wide range of casing and borehole sizes. The density measurement made by the three detector system is corrected for casing and cement thickness. The density data are used to calculate porosity and determine the lithology. The combination of density and neutron data is used to indicate the presence of gas.